~Eternal Snow~: Vocaloid Spotlight: Kagamine Rin Series 1. This artwork style kind of reminds me of Honey and Clover (review to come?). With the amount of vocaloid videos that I watch every week and enjoy, it's nearly impossible to post them all up individually (though it does makes for post count). Now instead, I'll be posting them in batches of 2 or 3, so that I can cover more ground on good vocaloid songs, unless it's really too good which deserves an individual post (or I got lots of things to talk about it "eg: Miku's Sakura no Ame"). OSTER project feat. Kagamine Rin - RING x RING x RING. The same group who brought to you Chocolate☆Magic (found in my Valentine Day post), comes a cute single of Rin. I really love the art and the way they "animate" the video, makes it really cute. Mp3 and Lyrics can be found here (to download you'll need to be a member of the site though). 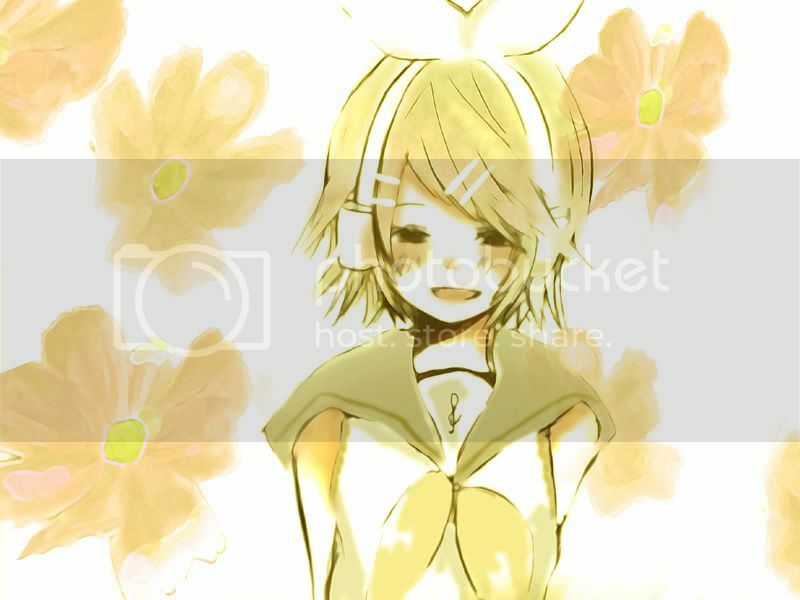 Kagamine Rin - Kokoro. Music and Lyrics done by Toraboru. A song of a robot being born without a "heart", on a road to self-recognization, to understand feelings and to know it's purpose for existance. There's another Rin song done by Toraboru but doesn't really ring along with me, just posting the youtube link if you're interested. Mp3 is found here, while Lyrics is here. Kagamine Rin - Yotsuba no Clover (4 Leaf Clover). Also done by Toraboru. I first came across this song from a video where someone was self-singing it, and I liked the song. Eventually went to search for the original which is this. However I think I found the self-sang version alot nicer, sweet sounding girl too. Throwing that version below this. I couldn't find a youtube version of it thus not putting it up. But if anyone requests for it (especially non-nico users), I'll rip it off nico and host it on youtube for you. They seemed to have taken down the mp3 link for this song (it's an old song), but there's still the lyrics which is found right over here. Another version of Yotsuba no Clover (someone else singing it). Going off-topic. Been too occupied with Shogun that I didn't do any post on the blog, but since I had completed my Imagawa campaign I had some time on hand to do this post. However I had just installed Rome Total War, so I might "forget" to update the blog again. Will try not to go down that path but no guarantee. My Sawatari Makoto figure had also arrived about a week ago, but have yet to take her out of the box and do a photo shoot. I'm thinking of a few places to bring her to take some photos but not sure where yet (Botanic Gardens is one place). *Wonders where in Singapore has lots of flowers and is not a tourist location, and no I'm not going Changi Airport for that, nor standing in the middle of the stretch of road that is along the way to the airport taking photos. * Anyway, until next post. Signing out. The shogun total war, did you let the com decide the battle or you plan the fighting yourself? And did you choose the chirstian to get more $ or the buddisht monks warrior? luvluvluv: Wow great PV wished I had spotted that earlier. Thanks for the link ^^. Might had used that video instead, but it's "nicer" to the author to post up the original first I guess. wongtcsg: I did most of the fighting myself, but when the battles became the 2k vs 2k near end game I couldn't be bothered and just used com decision. When playing Shimazu I went the Christian route, but for Imagawa I massed Buddhist Monk Warriors, which was so much better.